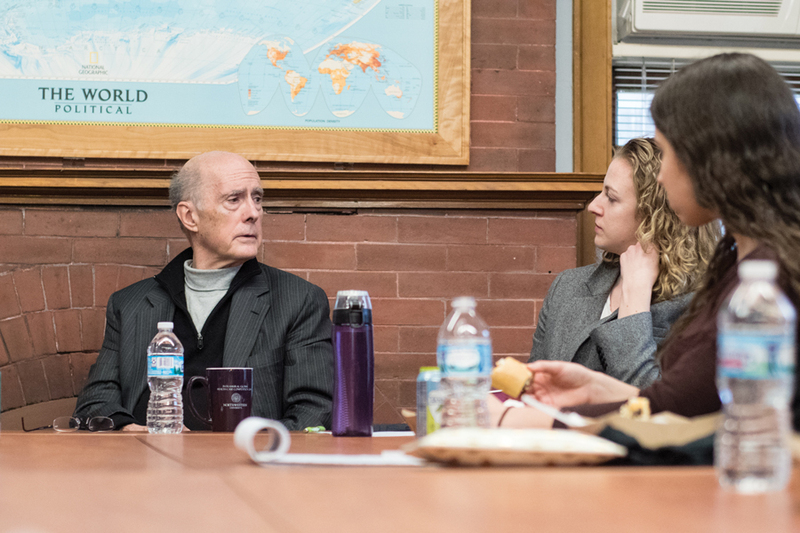 Former Deputy Secretary of State Strobe Talbott speaks to students Wednesday at the Buffett Institute for Global Studies. Talbott discussed the current U.S. relationship with Russia. In a Wednesday discussion focused on the United States’ relationship with Russia, former Deputy Secretary of State Strobe Talbott said it is time for reform in Russia. “Your generation will probably bring it to a boil,” he said. Talbott said the lack of order following the downfall of the Soviet Union led to “massive disillusionment” in Russia and a collective willingness to sacrifice freedom for order. This in turn facilitated Russia’s current circumstances under President Vladimir Putin, he said. The country “has a lot to worry about long term,” as it will enter “a demographic and health crisis” if the basic needs of the country are left unfulfilled, Talbott said. However, Russian authorities have made it difficult for journalists to report on the persistent discontent in the country, he said. Talbott first gave the audience an overview of his career path, saying he “chose” journalism as a profession because he thought it would teach him how to see and understand the world and help others do the same. Talbott said he found the skills he accumulated as a reporter very useful in the government. Talbott was a reporter for Time magazine before working in the State Department from 1993 to 2001. He served as president of the Brookings Institution, a Washington-based think tank, from 2002 to 2017 and remains a distinguished fellow in residence in the Foreign Policy Program there. Avi Dravid, president of Political Union, told The Daily that he thought talking to someone who has personal experience in foreign relations in an intimate setting would be a great opportunity for students on campus. “There’s a huge difference between reading about it in the textbook and speaking to someone who’s actually been there and done that,” the Weinberg junior said. Talbott said that compared to many European governments, the Trump administration is responding poorly to Russia’s attempts to “undermine the reputation and competence of the Western world.” By attempting to better relationships with Russia and Putin, Talbott said President Donald Trump may cause long-term damage in U.S. foreign relations. “We have a chief executive who doesn’t take terribly seriously what a lot of us would see as antithetical to our interests and our values,” Talbott said. David Gernon, editor in chief of Politics & Policy, said listening to Talbott speak was a great source of knowledge, especially in the current climate where it is easy to be disillusioned by foreign policy. A previous version of this article misstated the positions of Avi Dravid and David Gernon. Dravid is president of Political Union, and Gernon is editor in chief of Politics & Policy.